The Cadillac Escalade is more than a car, it’s a part of popular culture. What do you need to know before you buy an Escalade? Don’t worry, we’ll tell you everything right here in the Ultimate Buyer’s Guide. Contrary to what some remember, the Escalade was not GM’s first “luxury SUV.” That honor goes to the GMC Yukon, from which the original Escalade was derived. Generation one Escalades launched in 1999 were Yukons with a wreath in the grille instead of the letters “GMC.” In 2002, the Escalade was escalated with a little more power and a few more nice luxury bits. The 6.2 V8 joined the features list with the third bodystyle in 2007, and today we’ve got the razor-sharp ultraplush Suburban-derived masterpiece wearing the emblem. 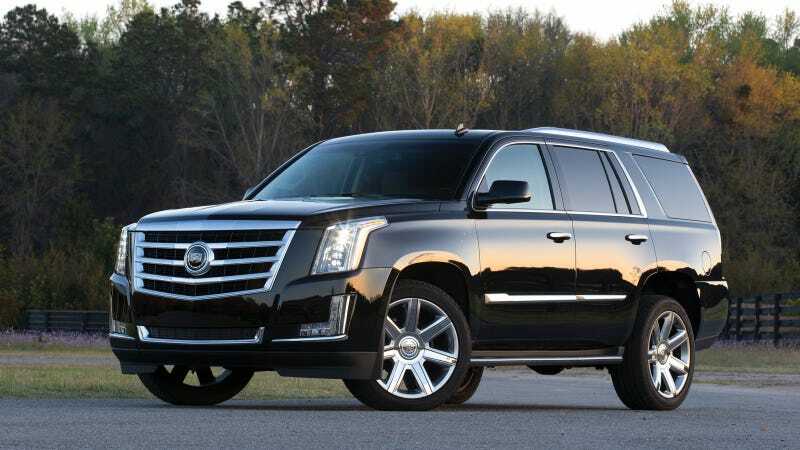 Throughout its life the Escalade has had an interesting history of association. It started out as an all-American aspirational symbol, was quickly appropriated as a nouveau riche mainstay in music videos, then ended up in the hands of mobster henchmen in daytime TV specials, and has finally come full circle to be something respectable again. The current and fourth generation Escalade has matured while hanging on to a healthy dose of ostentatiousness. It’s not for everybody, but damn if it isn’t a fine ride. The interior is mostly covered in great materials, with the odd cheapish kickplate here and there. Leather seats are father’s-office comfortable, dash wood feels soft and genuine, human-machine interface pushes hard on modern but remains relatively intuitive. Oh, are we actually moving now? I didn’t notice. The Escalade’s V8 has plenty of juice for aggressive merging or making a point at the end of an argument, but the real star of the driving experience is the Magnetic Ride Control suspension. What’s basically happening there is; there are little metal flake-particles floating around in the suspension’s fluid. Through the magic of magnetism, the car optimizes rigidity for comfort and control as the road surface changes and you hit bumps. It’s nothing like a long-travel shock soaking up a desert jump. Think of it as a museum curator carefully setting your wheels down into a display, except at 1,000 times a second. The result is miraculously minimal body roll for a vehicle with this kind of profile and a profoundly smooth ride down the road. Cadillac cranked up the “baller” on their Escalade with an all-new model in 2015. The new ‘lade got new exterior styling, a gorgeous new interior, and a fresh, more powerful and more efficient 6.2-liter V8. Early 2015 models came with a six-speed automatic transmission, but the eight-speed auto became standard later. The new fourth generation Escalade got wider, longer and a bit heavier than the outgoing model. It also got a revised suspension, electric power steering, new brakes, a new four-wheel drive system, fold-flat second and third rows, and new driver-assist features. This year’s 2016 model adds Lane Keep Assist and more CUE infotainment features like Apple CarPlay. Cadillac gives you one engine option and one transmission option. You get a 6.2-liter V8 with 420 horsepower and 460 lb-ft of torque bolted to a Hydra-Matic 8L90 eight-speed automatic transmission on the column. Yes, it’s a column shifter, and yes, that’s awesome. That powertrain combination gets the 6,000 pound beast up to 60 MPH in under six seconds. It’s a sumo-wrestler that can sprint. If you’re looking to buy an Escalade, you almost certainly don’t give a crap about fuel economy. I mean, maybe you do, but it’s not exactly at the top of your priority list. Well, hopefully it’s not, because the Escalade chugs fuel like a freight train, scoring a measly 17 MPG combined. It’s not surprising, given the Escalade’s tremendous girth and high-displacement naturally-aspirated engine, but it’s still pretty poor. Like much of the competition, the Escalade comes in two body styles: standard and long wheelbase. The $3,000-dearer long wheelbase version, called the ESV, is 20 inches longer than the base Escalade, coming in at a full 224 inches— about the same length as a 1967 Cadillac Coupe de Ville. It’s a big boy. Both body styles come in either two or four-wheel drive and can be optioned as Standard, Luxury, Premium or Platinum trims. Steering for all Escalades is electric and suspension is a coil-over-shock independent design up front and a five-link solid axle in the back with Magnetic Ride Control adjustable damping all the way around. Brakes are vented discs on all four corners with 13 inchers in the front and 13.6-inch rotors in the rear. Standard: Starts at $72,970. Notable standard features: 6.2-liter V8, eight-speed automatic transmission, leather seating surfaces, 12-way power front seats, power folding third row seat, heated and cooled front seating, heated second row seating, Magnetic Ride Control with Sport mode, LED headlamps with LED signature lamps, 20-inch alloy wheels, Surround Vision 360 degree above-car view, front and rear park assist, hands-free programmable power liftgate, CUE infotainment system with eight-inch touchscreen and Navigation, 16-speaker Bose Surround Sound audio system, Apple CarPlay, Android Auto, 12” instrument cluster, power tilt/telescoping steering column with memory, heated leather-wrapped steering wheel, wireless charging. Notable options: ESV Long Wheelbase ($3,000); Four-wheel drive with two-speed transfer case ($2,600); Rear seat DVD entertainment system ($2,095); 22-inch wheels ($2,995); Interior Protection Package: all-weather floor mats, cargo mat ($250). Luxury: Starts at $79,645. Notable standard features over Standard: 22-inch painted alloy wheels, Driver Awareness Package (automatic headlamps with auto high beam control, Lane Keep Assist, Lane Departure Warning, Forward Collision Alert, Safety Alert Seat), Side Blind Zone Alert, Lane Change Alert, Rear Cross-Traffic Alert, second row power release fold-and-tumble seats, power tilt-sliding sunroof, configurable head-up display, Theft Deterrent Package (self-powered horn, interior movement sensor, vehicle inclination sensors, door lock shields, glass breakage sensors in rear quarter glass and liftgate window). Notable options: ESV Long Wheelbase ($3,000); different 22-inch wheels ($1,995); otherwise similar options to Standard trim. Premium: Starts at $84,145. Notable standard features over Luxury: Driver Assist Package (Front and Rear automatic braking, adaptive cruise control, automatic safety belt tightening), Illuminated exterior door handles, LED cornering lamps, rear seat entertainment system (9-inch overhead screen, remote control and infrared headphones). Notable options: ESV Long Wheelbase ($3,000); Four-wheel drive with two-speed transfer case ($2,600); Interior Protection Package ($250). Platinum: Starts at $91,950. Notable standard features over Premium: Leather wrapped instrument panel, leather wrapped console, leather wrapped doors, suede headliner and pillar trim, 18-way massaging power adjustable front seats, Napa semi-Aniline leather seating surfaces for front two rows, Mulan leather seat for third row, center console cooler, unique chrome grille, unique 22-inch alluminum wheels, unique door sills. Notable options: ESV Long Wheelbase ($3,000); Four-wheel drive with two-speed transfer case ($2,600); Power-retractable assist steps ($1,750); Interior Protection Package ($250). The $72,970 (plus $995 destination fee) “base” model has all the important stuff; the 6.2 V8, cool digital gauges, and Magnetic Ride Control suspension. The $90,000 Platinum version has significantly nicer seats and surfaces inside, but twenty grand is a lot to pay for the privilege. Sadly, the Escalade EXT pickup truck got axed a few years back, so there’s no longer a hay-hauling blinged-out Escalade truck available. It’s a shame, but regardless, we think you pretty much get the most for your money in the short-bodied (Tahoe-length) 4WD version of the standard car.